Recently, the folks at Smile.Y sent me a sample of Ideal No Calorie Sweetener, a sugar substitute in which the main ingredient is Xylitol. While my favorite sweetener is regular sugar, I do use alternative sweeteners to cut calories (specifically in yogurt, oatmeal and tea) and decided to give the Ideal Sweetener a test run. It was great in plain yogurt (to which I almost always add a dash of lemon juice), I loved it in tea, where I couldn’t detect any aftertaste at all. And finally, I’ve been using it quite often in oatmeal. I need a lot of added sweetener to enjoy my oats and if I were to add my beloved sugar, I’d be piling on a lot of calories. So in oatmeal, the Ideal Sweetener has been great. 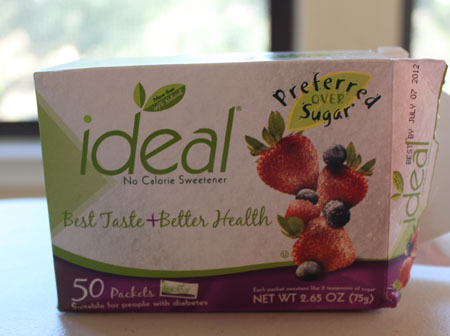 If you use sugar substitutes for health reasons or to cut calories and want to try something a little different, definitely try the Ideal. If you’re like me and usually detect an aftertaste (even if it doesn’t always bother you because you’re so used to it), you may be pleasantly surprised by Ideal’s clean finish. If you do try it, let me know what you think. On the box it says “Preferred Over Sugar” and I’d like to see if it really lives up to that slogan! As for baking, Ideal has a baking blend, but in small recipes you can just use the packets and use one packet for every 2 teaspoons of sugar. I used the Ideal packets in a batch of muffins. They rose very nicely, and had a great initial flavor, but there was a slight aftertaste. It wasn’t awful, but I could taste it. So in the case of this particular recipe, I’d say it’s good if aftertastes doesn’t bother you or if knowing you’ve cut the sugar is worth the slight aftertaste. 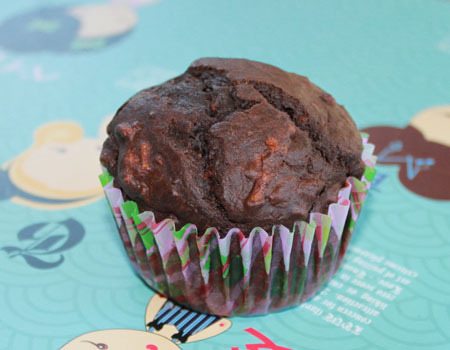 For test purposes, I made the Fiber One Chocolate Muffins using 9 packets of Ideal. 1.Heat oven to 375°F. Place paper baking cup in each of 6 regular-size muffin cups. Place cereal in plastic bag; seal bag and crush with rolling pin. 2. In medium bowl, mix cereal and buttermilk; let stand 5 minutes. Stir in oil and egg. Stir in remaining ingredients except chocolate chips. Stir in chocolate chips. Divide batter evenly among muffin cups. 3.Bake 15 to 20 minutes or until toothpick inserted in center comes out clean. Immediately remove from pan. Serve warm. I have been using ideal for almost 2 years and love it….It did cause a little gas but when introduced slowly your body adjust to it. I love this and use it in almost everything…I tried Stevia and found it to have an awful after taste (almost like soap) so I won’t use it anymore. I bake with ideal and have had no issues with it thus far. It’s a fav in our house and I’ve tried them all lol. I’ve tried the Ideal confectioner’s sugar to make frostings for sugar-free (Stevia) cakes (thanks Anna for the ref!). I found it VERY sweet, I’d say too sweet when combined with cake. The kids were bouncing off the walls! It maight be low calorie but it sure doesn’t seem like it. Might have to cut the confectioner’s sugar with something else to keep the same volume of the frosting. Orchid, I liked the texture of the chocolate muffins, but your suggestion of adding a little applesauce might make the muffins even better by adding a little more bulk and moistness. I do a lot of sugar-free baking and so far I’ve done it all with Splenda because it is heat stable. One of the things about baking without sugar is that it can cause some texture problems with them (because sugar adds moisture as well as sweetness).I usually compensate for this by using applesauce (I also do this to replace much of the oil). How was the texture of the muffins that you made? I have been using this sweetner for over 6 months now. Love it! The sugar alcohol effect diminishes over time as your body gets used to it. Xylitol has been around over 30 years. Thanks, Anna. I have some on my shelf but haven’t tried it yet. Like Melissa, sorbitol doesn’t agree with me and I get headaches from Splenda but have baked with xylitol a couple of times with pretty good success and no stomach upset. I prefer maple syrup on my oats, and have decided the extra calories are well worth its delicious flavor! I got the same sample from Ideal. I used like half the packets for a cookie I made a while back. Didn’t love it. But it wasn’t gross either. It definitely had an aftertaste. I don’t drink tea or coffee so I hadn’t used them in anything else. I think I’ll try my oats and/or yogurt, I never even thought of those. My SIL strongly believes in Stevia and uses the flavored drops in everything. I have the same problem with sugar alcohols. In very small quantities, I’m ok, but not every day. There are stevia brands these days that have little to no aftertaste (at least in my experience). Trader Joe’s has a good one, and there are some new ones available at mainstream grocery stores. Lee, they sell it at my local grocery store. I also noticed a store locator on their site. David and Melissa, that is true about the sugar alcohols. I’m not sensitive to them at all, apparently. As for Stevia, I’ve tried it in all kinds of things and the aftertaste is just too much. It lasts forever and reminds me of toothpaste. Hmmmm, maybe I’d like it in mint tea. Oh my gosh, this sweetener would make me so sick. Anything that has an -itol suffix at the end is a sugar alcohol, and as described above, many people have an intolerance to it. I have to be careful not to eat anything with sorbitol in it, which is basically what all sugar free gums have in them these days. I was getting sick from chewing Extra gum, and it took forever to determine what it was. I thought I was developing food allergies, or maybe irritable bowel syndrome — horrible!! Recently, I was excited to get two free boxes of Truvia packets, only to discover that it too is based on a sugar alcohol! I had thought it was stevia, which is obviously what they want people to think by the name! A good sugar free sweetener is stevia — if you don’t mind the flavor. I think the taste is similar to Splenda. It is natural, and I haven’t heard of any studies done saying it is bad for you. I have been using powdered stevia I buy from Trader Joe’s. Have you ever baked anything with it?